Laughing at Liberals has it here. 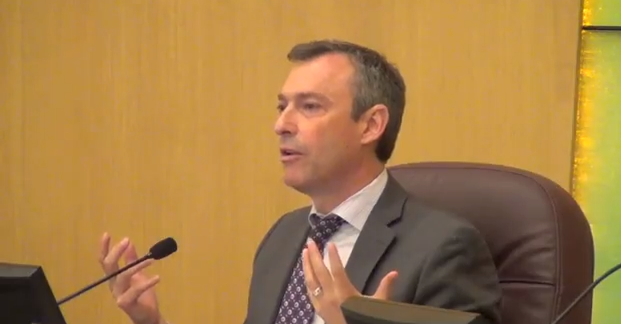 Multnomah County Chair Jeff Cogen admits passing these gun ordinances won’t make a difference to criminals. That is just ridiculous. Municipalities, of course, have the ability to place time, place and manner restrictions on rights–for instance first amendment rights, such as when they allowed Occupy Portland to squash the rights of the Portland Marathon or allowed them to destroy the two downtown parks, but I’ve never heard that you having gun rights under the Second Amendment necessarily deprives someone else of their safety is an outrageous, dangerous and incorrect assertion. But do these ordinances do that? And then arguing from reductio ad absurdum, claims that these laws should be passed because why bother to have laws at all? It largely adopts language approved in late 2010 by the city of Portland in making it unlawful to fire a gun within the county. It also bans possession of a loaded firearm in public, makes failing to report the theft of a gun a crime and makes it illegal to allow a child to possess a gun without the owner’s permission. In addition, it establishes curfews for minors, including a 7 p.m. curfew for juveniles who have been convicted of a gun crime. The ordinance does not apply, among others, to those with concealed handgun licenses, hunters, people defending themselves, retired or off-duty law enforcement officers or those on their own property as long as they aren’t endangering others. In fact, according to one man who testified at the hearing where the Board unanimously passed the new ordinances, it would make him an automatic criminal. Portland resident Rick Gilmore told commissioners he would be violating the new law any time he slaughtered a hog or steer on his property off Northeast 53rd Drive. What the passage of these ordinances do, however, is highlight the political grandstanding of a far left political body which has little stomach for actually enforcing the laws on the books and locking up the criminals–young and old–who break them.